ONE Grey suede over the knees boots for under $250. // TWO Tie this silk scarf like a neckerchief to perk up an outfit. // THREE Is it too early for holiday candles? I say never. // FOUR Top your outfit with this floppy wool hat. // FIVE If a face oil and retinoid had a baby, it would produce this miracle product. // SIX This long sleeved stripped shirt will be your go-to layering piece. // SEVEN About your chelsea boot with a subtle pointed toe. // EIGHT This wool coat has a teddybear like texture. // NINE A stylish leather bag that will hold almost everything. // TEN This season's "it girl" sunglasses are totally dreamy. // ELEVEN Get this gold signet ring engraved for a personal touch. // TWELVE I'm still not over this check print. // THIRTEEN Fill this bowl with fruit as an easy centerpiece for your dining room table. 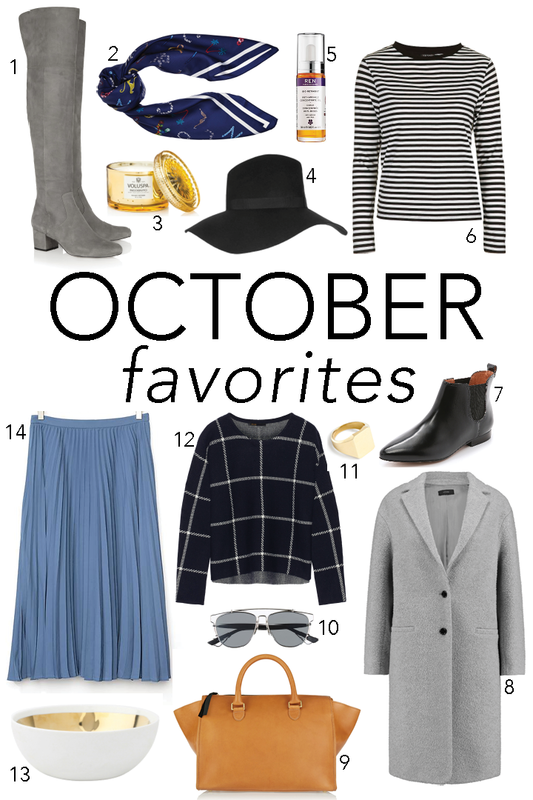 // FOURTEEN Pleated skirts are my new obsession, and this blue is perfection.